It would be extremely easy to overstate the importance of LCD Soundsystem, the musical project of James Murphy. He makes dance and pop music. It’s very very good dance music that grooves with the best of them while hitting all the pleasure centers available to pop music. It’s epic and casual, bombastic and primitive, and arty and absolutely straightforward, but towering over all of that is Murphy’s knowledge of the history of the music he cares about and his extreme self-consciousness about his position in it. In conversation, stage persona, and appearance, he comes across as modest, and he’s managed to convince himself and the world that his centrality to the music he makes is unconnected to his ego. 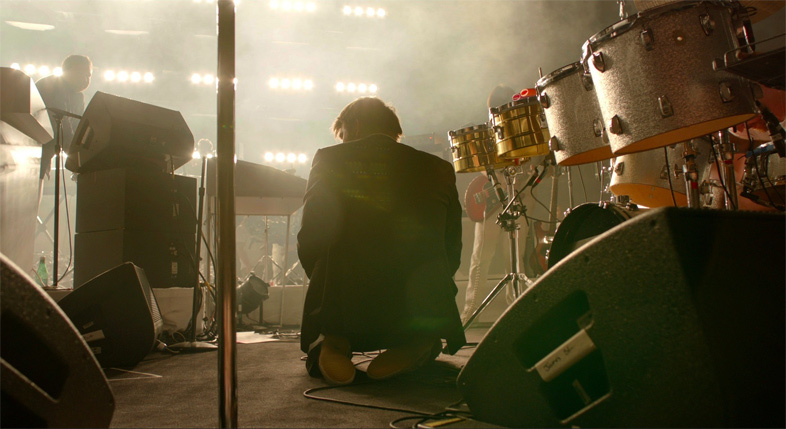 Famously, Murphy creates almost all the music on LCD Soundsystem’s albums himself, and while his live shows are joyous and free-seeming, the large group of talented musicians he’s assembled to perform the songs have little musical freedom. Also famously, Murphy is old for a pop music star. LCD Soundsystem began when he was in his 30’s, and so it came that he made the conscious decision to end the band this year. In keeping with his vision of his place in history, the decision was made to have a farewell concert at an Important Venue (Madison Square Gardens as it turns out) and create a film of the show and the band’s end. To further highlight the capital-S Specialness of everything, the movie would be shown across the country one night only: July 18th. And here we are, talking about it. So, how does a film about a band that makes a point of being untheatrical play? It’s actually completely irrelevant. To fans it was supremely satisfying. And that’s it. Non-fans would hardly have made the effort to seek out a screening (here in Miami, it played on one screen at Tower Theater, which added a second showing only after the first sold out). The film is footage from the concert, intercut with scenes of Murphy from the day after the show and of Murphy being interviewed by professional overthinker Chuck Klosterman. Let’s get one thing out of the way: the film gets the music exactly right. A little more than half-dozen songs are preformed in their apparent entirety (I say apparent because I suspect that some editing did happen) in the film, and a few more are intercut with dialog and other scenes. Always the music is supremely satisfying. Murphy has a knack for making everything sound vivid, propulsive, and loud, and while all the sound comes from the people and machines on stage, it’s clear that a lot of time was spent mixing the sound for the film. At several points the film came surprisingly close to the feeling of being at an LCD Soundsystem show. But they were always brief, because they always cut away to something from Murphy’s bittersweet Day After. Here’s James Murphy walking his dog. James Murphy making coffee. James Murphy listening to his voicemail. Not all these moments are completely useless. There’s a funny moment where Murphy receives a trophy for selling out Madison Square Garden and declares it a “profoundly sad object.” And the scene of him choking up in a warehouse with all the band’s equipment, which we’re told will soon be auctioned off, is genuinely touching. But there is absurdly too much of this stuff in the film — a long introduction and then sandwiched between every song. I have to make a special note about the interview sequences. Klosterman is the author of many entertaining books and magazine columns (most recently he’s been appointed The Ethicist at the New York Times), and band interviews are his speciality. But in the context of the movie, the exchanges between him and Murphy are ineffably uninteresting. One exchange has Klosterman trying to coax Murphy into confessing what he believes to be his biggest mistake with the band. And of course the end of the band is a big topic. The only thing in this self-referential origami missing is an exchange about the interview itself, whether Murphy considers himself important enough to deserve to the subject of Klosterman’s first ever filmed interview. What’s next for LCD Soundsystem? Maybe a coffee table book. With an essay by Klosterman based on the interview in this movie. But and so. If you went, you’re thrilled to have gone. (As I’m glad I went.) If you didn’t, you have enough to shrug about. Either way, we can hope there’s another movie coming. One that ditches the extra stuff and gives us more of the music. Where, you know, they actually do shut up and play the hits.